A devoted father, Roy Tomlin (Michael Shannon), goes on the run with his young son, Alton (Jaeden Lieberher), who possesses special powers. With the help of his friend Lucas (Joel Edgerton), Roy will literally do anything in his power to protect his son from the religious cult and the federal government, who are mercilessly hunting him. 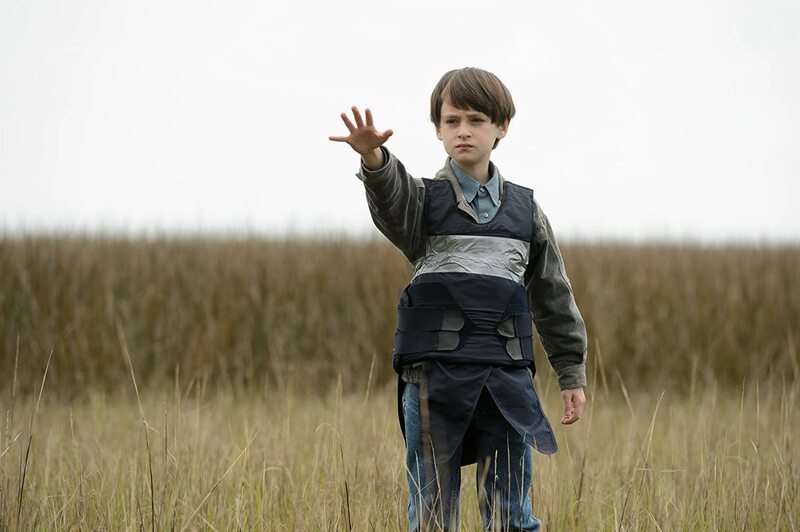 Midnight Special is a sci-fi chase film, one that echoes the sci-fi movies of the ’80s. Midnight Special is a strange one. I was both intrigued and restless while watching it, yet I really enjoyed the film’s visual flair and special effects. It was the narrative and the general direction that I was most displeased with. But it starts off good enough. So, let me talk about the story. Straight from the get-go, we are introduced to Alton, and the film establishes that he has been a wanted figure for quite some time. Unlike typical sci-fi films that try to set up the focal point of the story, Midnight Special plunges us straight into the action. The film instantly presents Alton as strange and mysterious, clearly evoking that he is unlike us. He wears goggles wherever he goes and his father keeps him in motel rooms with boarded up windows because he can’t be exposed to daylight. He has become a nation-wide talking point, as we see Roy and Lucas watching a news story in the early moments of the film, just before they decide to flee with Alton. What follows is a surprisingly slow-paced film, which balances visual storytelling, with familiar themes involving the struggles of parenthood. One of the problems with the film’s storyline is that it never fully discloses most of the characters’ motivations. It’s clear that Roy is motivated to protect Alton at all costs, due to his fatherly devotion and his belief that Alton is destined for something great. On the other hand, Lucas seems to lack a purpose and only provides assistance to Roy and Alton’s various upheavals. There is a lot of unanswered questions and characters lacking goals, as well as them being underdeveloped. I have not seen any of Jeff Nichols previous films, so although the ambiguous style and tone he creates are unique, in Midnight Special, it lacks an edge. Most of the characters are difficult to emphasise with, and I found myself struggling to engage with Adam Driver’s character, Paul Xavier, a specialist that the FBI hire to further interrogate the information they have regarding boy. Driver plays a very dull character with little energy, which is a stark contrast to his excellent performance as Kylo Ren, in Star Wars: The Force Awakens. For some reason, the characters come across as downright brooding. I really struggled to stay interested in these people’s lives, but the relationship between Roy and Alton is very believable. The film positions the viewer within their struggles, as well as the relationship between Alton and his mother, Sarah (Kirsten Dunst), who reconciles with Alton after a period of separation. Lieberher’s portrayal of Alton is fundamentally what holds the film together, as the whole plot concerns itself with this one character. His character’s development is pretty cool, but there’s nothing too outlandish to be seen here. He seems to represent the idea of believing in the divine and something which is much more powerful than ourselves and everything we know. So there are profound messages about faith, but they are implicit rather than overt. I think what prevents Midnight Special from being a substantial film, is its anticlimactic ending. In the build-up to the film’s end, it feels like something explosive is going to occur, but the ending provides little satisfaction. In terms of achieving mystery and subtlety, the film accomplishes these goals, but its overall tone and narrative direction are very unsatisfying. I found myself often waiting for something really good to happen. Perhaps my expectation did not correspond with the type of film Midnight Special is, but it’s unlikely I’ll watch this film again. Midnight Special offers a peculiar viewing experience, which might not be what you desire or expect. While not a bad film, it’s not one that will remain in the memory for too long. Stars: Michael Shannon, Joel Edgerton, Kirsten Dunst.